At least five people, including three children, have been killed in the US as a massive storm system with damaging wind and hail moved across the country and began drenching east coast states. A tornado touched down and spun toward Enigma, Georgia yesterday, after 17 twisters were reported on Saturday across the south from Texas to Alabama. Meteorologists from the US National Weather Service Prediction Center said they expect further severe weather from Florida to New York, with the most unstable parts so far in Georgia. Tornado watches were issued for most of West Virginia, most of North Carolina, Virginia, Pennsylvania and Maryland and parts of Ohio and New York. The watches mean conditions are favourable for tornadoes to form. "Whenever you have a tornado watch, you also have threats of severe thunderstorms," a meteorologist from the NWS Prediction Center explained. 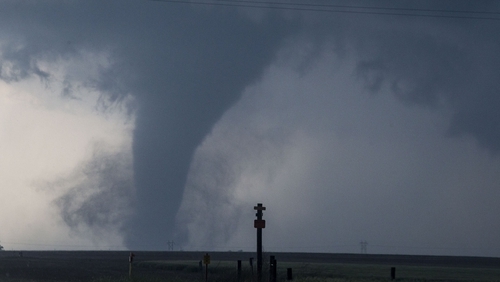 More than 100 million people from the middle of the United States to the east coast were at risk of extreme weather, facing warnings of heavy thunderstorms and another round of tornadoes. Nearly 2,300 US flights were cancelled, more than 90% of them at airports in Chicago, Houston,Texas, Charlotte, North Carolina, Pittsburgh, Columbus, Ohio and a dozen major airports on the eastern seaboard. The storm's cold front also brought snow to Chicago. Two children, siblings aged three and eight, were killed on Saturday in Texas when a tree fell on the car in which they were sitting. A 13-year-old boy drowned late on Saturday when he fell into a drainage ditch filled with flash floodwaters near Monroe, Louisiana. An unidentified victim's body was also found trapped in a vehicle submerged in floodwaters in Calhoun, Louisiana. In addition, three people were killed when a private jet crashed in Mississippi on Saturday. However, authorities said they were uncertain whether the crash was caused by the weather.